More on the Peerless Dual Screen Mount for the FPZ-600 Stands ACC604 below. Call our Peerless AV experts at 800-807-1477. VESA 100, 200x100 and 200x200 compatibility. A UL-tested, hook-on design for simple installation. Easy switching from portrait to landscape orientation. 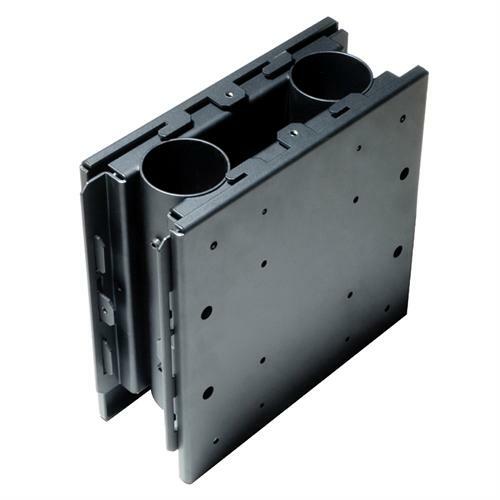 Two 32-60" flat screens up to 200 lbs each, with a mounting pattern up to 200x200mm. PLEASE NOTE: The ACC-604 can also support larger screens and non-VESA mounting patterns if used alongside the PLP screen adapter plate (sold separately, below).